Made it out for another LR this morning, this one was 6 miles. Two interesting things to point out. The first is that this is what's called a Cutback Week. The training program is sort of divided into three week cycles where you build up mileage for two weeks and then cutback the last week. "These step back weeks are important to give your body a chance to recover from all the hard work you've been asking of it." our handy CARA newsletter points out. The thing about the very first cutback week is that the mileage is so relatively low, especially for veterans, that a lot of runners sleep in and skip the group run because even in the hot summer, you can probably manage 5-6 miles on your own later in the day or even Sunday morning if needed. Since no one in our group admitted to being Novice, we did 6 miles. When we get deeper into the season, there will be more people who speak up and not want to do any more miles than they absolutely must. The second thing is I had almost forgot how much I dislike getting up early in terms of having to be good on Friday nights. I turned down a ticket to the White Sox game which turned out to be a good decision since they lost in extra innings. Instead I got my bike out of the storage locker, put air in the tires and joined Fitz and Tracy at Moody's Pub. They were there to socialize with a ski club group even though Fitz doesn't ski. 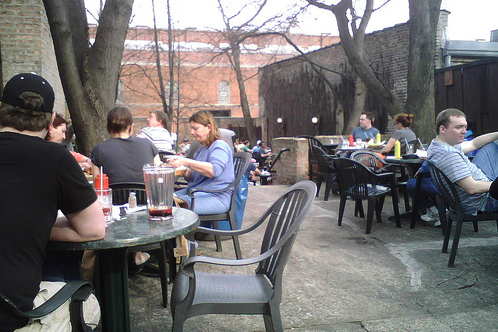 Stacy was grumpy because she was hungry and the service was slow since it never seems to occur to establishments that have outdoor beer gardens to check the weather report and equate warm weather with people wanting to eat outside and staff appropriately. I wasn't too hungry because I had my usual All-You-Can-Eat Buffet lunch at Roundhouse in Lombard. However, after biking 4.5 miles and then having a couple beers, the hunger arrived so I ordered the shrimp basket (it's more carbs than a burger, right?). I'm going to have to scale back on the visit to the Roundhouse if I want to lose weight. While I love the pizza and the fried chicken, there is nothing on the menu that is even in the zip code of healthy. I mostly do it to kill time and get out of the office. I think I made a faux pas anyway because I asked the first waitress I saw for a diet coke and apparently this other waitress who has served me before was whom I was supposed to deal with. Waitress protocol is a messy business and I don't want to be on the wrong end of a pissed server. At Moody's I was pleasantly surprised to run into another friend who apparently got engaged to a guy she's been dating for the last three years and has known forever. It was cool to catch up and share some quick here's what you can learn from my wedding experience advice. Also at Moody's was this Asian Lady that Fitz and I use to run into at Eurocircle back in the day. She's a chiropractor who is also part of the ski club and a friend of Engaged Friend. She was actually being kinda annoying by talking about nothing relevant. She was trying very to keep the conversation flowing, so I give her credit for that. When she got up to get another drink I leaned over and ask "is it me or is Dr Asian kinda annoying?" Tracy confirmed that Dr Asian was also getting on her nerves -- and at this point Tracy had her food and beer so she was happy again -- though Fitz said he hadn't noticed. To use Fitz' new catch phrase: Shocking!